The bright blue store displays carry a bold message: buy one, give one. Beneath is a line of products like coffee, chocolate, and oatmeal. The display looks like it could be for another national brand – but the products are made right here in Boise — and there’s a mission behind this brand. Happy Day Brands started a trial program with Albertsons in its new flagship store on Broadway Ave. in July. Now that trial is expanding – with more stores and a more prominent display. 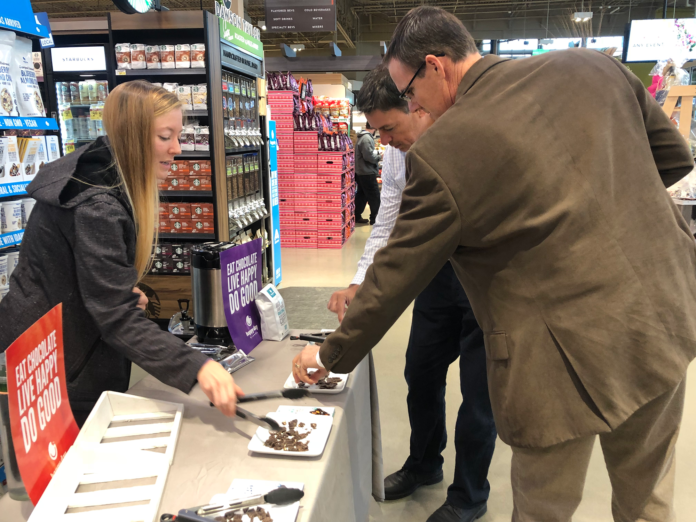 Mark and Jeanette Priddy founded the company to not only bring a line of products they believe in to store shelves, but make a big impact in communities. The new business is an off-shoot of the Priddys’ non-profit work with Full Circle Exchange. That effort gives women the opportunity to gain job skills through training, experience, and economic opportunity. Happy Day Brands not only helps fuel the mission of Full Circle Exchange, the sale of the products themselves helps to benefit the hungry in Idaho – and soon, perhaps, beyond. When a customer buys one of the company’s products, a serving of oatmeal is given to the Idaho Foodbank’s School Pantry program. That helps feed hungry families and supplements the Foodbank’s Backpack program, which sends a bag full of food home with a child in need each week. 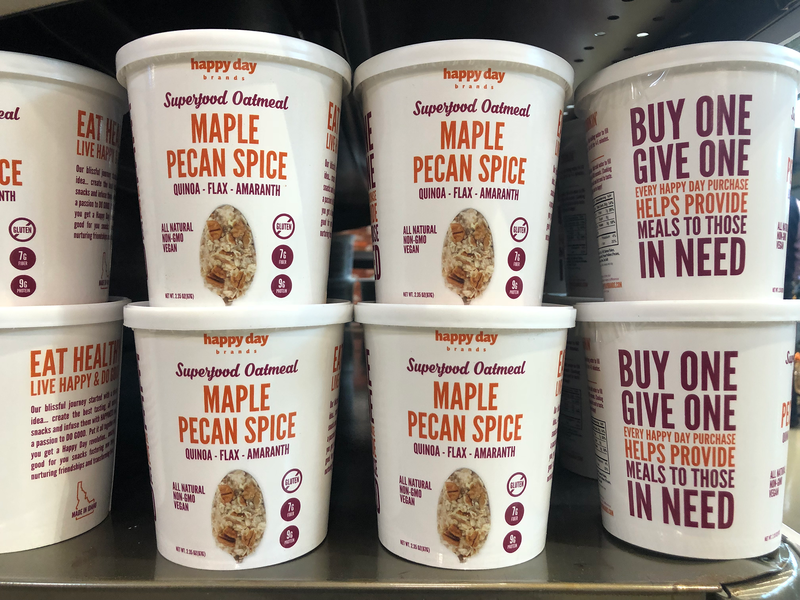 The pantry network had a need for a healthy breakfast product, which is where Happy Day Brands comes in. The company has committed to donating more than 100,000 servings of oatmeal to more than 1,500 families at 35 schools. Happy Day is a B-Corp, a for-profit entity; the B stands for benefit. The idea is to build businesses that benefit not just their shareholders, but any stakeholder that may interact with the business and its products or services. “There’s always been the non-profit and the for-profit. When we started Rembrandt’s coffeehouse years and years ago, B Corps didn’t exist here. But social entrepreneurship was kind of something new. And so we said ‘let’s provide kind of a for-profit vehicle that could then help a nonprofit,’ which we are doing,” he said. Now Happy Day Brands lets them use the mechanics of a business to create social good. “Not only can we actually create a great profitable company but alongside of that and simultaneously we want to really create an engine for good,” he said. But without a quality product, Jeanette said the entire thing wouldn’t work. Cause marketing has become more common in recent years, but she wants Happy Day to be a notch above. 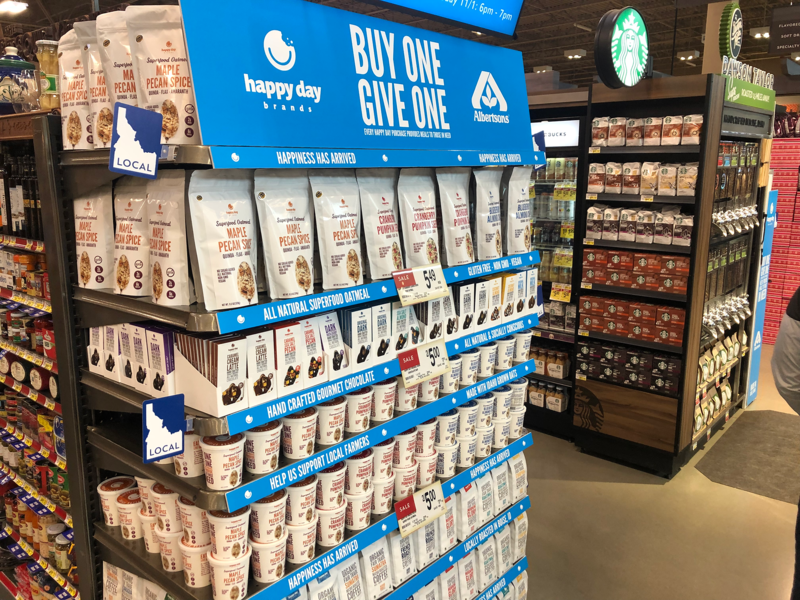 When the splasy new Broadway Albertsons opened in July, Happy Day Brands had a small cardboard display with a few products. After the test, the line expanded to include a full endcap with more shelf space. And the products are rolling out to additional stores. In addition to Broadway, the products can be found at 250 S. Eagle Rd., 4700 N. Eagle Rd., 900 E. ParkCenter Blvd., 1650 W. State St and 6550 S. Federal Way, according to Holland. The expansion can help Happy Day grow, but they want to structure it properly. The solution was to engage food banks in other areas. When a consumer is making a purchase, their dollars are helping support the local community in which they live. “We’re partnering with great companies like Albertsons and they’re really coming alongside of what we’re doing,” he said. He said the Boise-based grocery giant is helping to further their mission. For the couple, the expansion is a culmination of a lot of effort – and still the beginning of a road they are excited to be on.